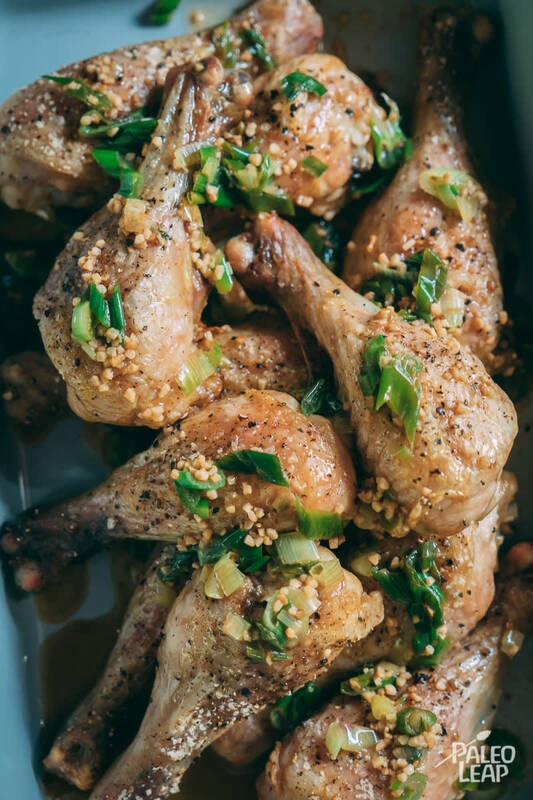 Chicken drumsticks are simplicity at its best. You can dress them up as creamy chicken coconut curry drumsticks, or dress them down with a generous dash of salt and pepper. Anything goes! Keep it in the back of your mind that you can always use chicken thighs instead of drumsticks. They add a little more fat, extra flavorful bites, plus there is more crispy skin to indulge in. Just add a few more minutes to the baking time and all will be golden. When work and life leave you with little time in the kitchen, uncomplicated recipes can be lifesavers. They get bonus points for being budget-friendly too! If you don’t have any green onions on hand, you could finely chop some chives, or parsley instead. And if you happen to have half of a leftover lemon, squeeze that on just before serving, even add some zest to the butter sauce. Simple recipes (baked chicken for example) are great places to use up leftover herbs and vegetables, appreciating zero food waste all the while. Whether you grab them by hand, or choose to use fork and knife, one thing is for sure: a bowl of cauliflower rice will sit nicely by their side. You may want to try Southwest-style vegetable cauliflower rice, if you are searching for some spicier notes and colorful vegetables in your meal. If you would like to set some earthy tones on the table, then let us suggest cauliflower mushroom risotto to complement the drumsticks with garlic-butter sauce. Generously season the chicken to taste with sea salt and freshly ground black pepper making sure they are well covered. Place the chicken legs on a baking sheet, and bake in the oven 45 to 50 minutes, until no longer pink. Melt ghee in a sauce pan over medium heat. Add the garlic and cook until fragrant 2 to 3 minutes. Add the sliced green onions to the ghee and cook, stirring another minute or two. Pour the sauce over the chicken drumsticks and serve.